Shiloh is a Federal Marshal at the Paranormal Investigators Unit. She’s also half human and half djinn. Shiloh and her crew are being called when paranormals are involved in a crime. She’s looking forward to a few days off when she gets notified that a group of vampires have taken over a whole trailer park, keeping the residents hostage. Shiloh's boss is missing and she is the second in command. She needs to make difficult choices to stop the situation from getting out of hand and quickly has to find a way to end it before any humans are being hurt. Djinns and vampires repulse each other by nature, which is not very helpful since Shiloh needs to deal with the vampire master, Tennyson. Will Shiloh be able to solve this case without the guidance and crucial advice of her boss? Tennyson has been a vampire for centuries and has created a lot of other vampires that he considers his children. Twelve of his children are missing and in other vampire clans vampires have disappeared as well. To stop more of his children from being abducted he's taken desperate measures. With a whole trailer park hostage the place is crawling with police officers, which gives them a feeling of being relatively safe. Tennyson needs Shiloh’s help to find out who’s behind the abductions. He can’t sense his children anymore and he has no idea if they are still alive. Can they put their instinctive feelings aside to work as a team? Shiloh is the daughter of the most powerful earth djinn there is. She has no filter and will ask difficult questions when she needs to. Shiloh is a caring and kind person, but she can also switch to battle mode in a second. She knows that the vampire abduction will probably be the biggest case in her career and she hopes that she’s making the right decisions. In a world where the truth is hidden underneath the rules of the paranormal, it’s hard to put any puzzle pieces together, but if anyone can do it it's Shiloh. I always love to read stories with a strong heroine and Shiloh is an amazing leader. She’s tough, smart and intuitive. I loved that she's a quick thinker who slowly unravels the mystery. I was very eager to find out more about the awful crimes and the mastermind behind them. Stray Magic is a fast-paced scary story about the darkest side of the paranormal world. I'm a big fan of stories about vampires, djinns, demons and other paranormal beings and Stray Magic has them all. Even though their species normally don’t mix, I loved the connection between Shiloh and Tennyson. They help and protect each other and they make a great team. Kelly Meding a skillful world builder and I liked reading her great original story wherein paranormals and humans are living side by side. It feels completely normal to have vampires and other beings existing among us. I really enjoyed this gripping first Stray Moon book and can't wait to read more. If you like to read fast-paced and dark stories with unexpected twists Stray Magic is a story you shouldn’t miss. One very lucky reader of With Love for Books will receive a bound manuscript of Stray Magic by Kelly Meding. 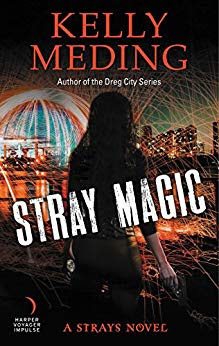 Stray Magic sounds like an urban fantasy that has fantastic pacing and world-building and filled with characters I want to learn more about. Sounds like my kind of book! 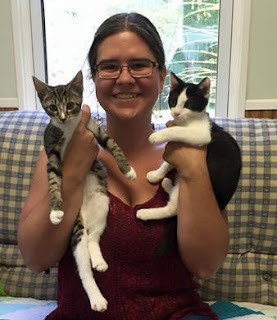 I love those fur babies! I love dark stories! Thank you! fab review and a cover that makes a girl wanna dig in there!! Darks stories are so thrilling! Love them. Hi Kelly, which one is Puck and which is Jinx? I actually thought of the name Djinn for our latest rescue cat - he really is a little demon!